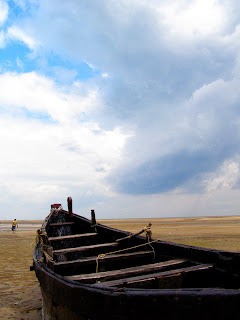 Flat beach, small and playful waves, a few country boats, roving fishermen and casuarinas coves…near by is the estuary of Subarnarekha River. 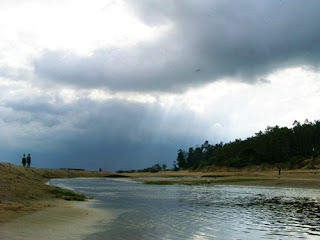 The beach is no other than Orissa's Talsari, which lies close to the West Bengal border. 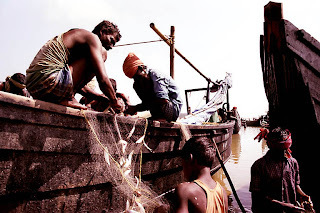 Kaibartas, the fishermen community are the main group of people living here for generations. 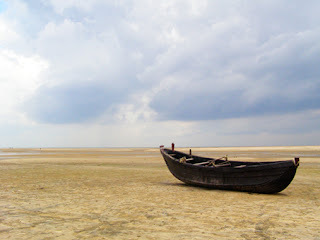 The boat used by them is called patia for fishing both in the estuary, beach seining and open sea. 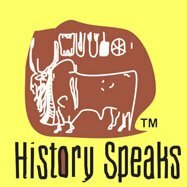 Yet perhaps they may not know their boats built in reverse clinker method has a parallel to the boats that once dominated the oceanic trade of Medieval Europe. 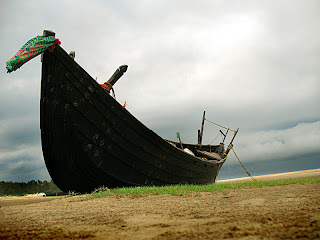 Patias are reverse clinker sailing boats built almost entirely of Sal (Shorea robusta) and are heavily coated inboard and outboard with tar. Apart from modification made to accommodate the engine, all sizes of boats are evidently built in the same manner. The strakes of the patia are fastened together by nails, which are driven through the overlap and clenched by hooking the emergent point back into planking. 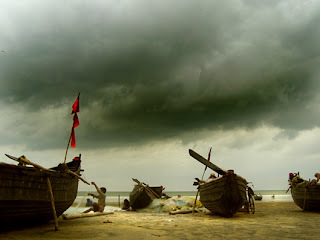 The builders of Patia boats are simple folk with no formal background in boat designs. Hence, no drawing, models or moulds (templates) are used when building a patia…measurements are used mainly to ensure symmetry. 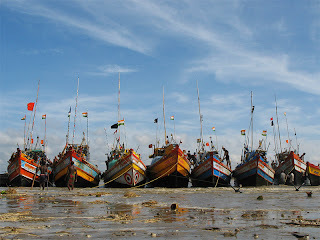 The boats are largely built 'by eye' and much depends upon the experience of the builder. Patias are used in specific seasons of the year. The main season begins from September/October to March/April. The sailing of patia works within about 5 km of the shore, while the motorised may go out to 20 km. 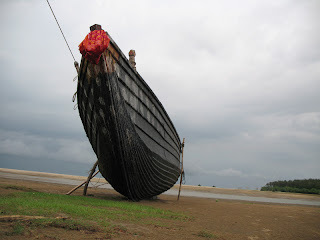 There is no historical record of Patia boats, when it came into use in Talsari water, who were its first users, and so on. 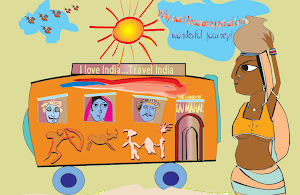 The only evidence was provided by Thomas Bowrey, a traveller of late 17th century on Orissa coast. Thomas described the boats as Patella – flat bottomed, barge like clinker-built boats with protruding crossbeams, used to transport salt. They had a single mast and were steered by large median radar. 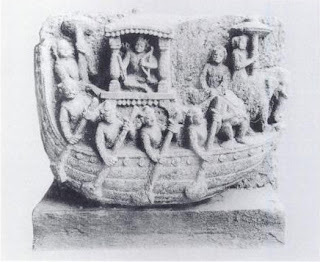 Prior to Bowrey are the art historic evidences – Reverse clinker planking, in which each succeeding strake overlaps in board the upper edge of the strake below (rather than outboard as in the European clinker), is depicted on 11th/12th centuries monumental carvings from Orissa. 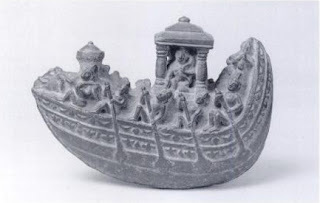 A12th century stone relief in the Jagannath temple in Puri has a depiction of reverse-clinker boat. 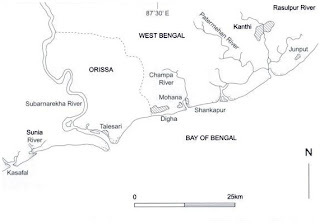 Presently, the use of reverse clinker boats is found in Sweden and Bangladesh, beside Talseri and nearby Digha (in West Bengal). There are several medieval examples in Europe, where the reverse clinker boat has been depicted on seals, in archaeological remains and drawings.